​The sound of gunfire is the most hazardous non-occupational noise many people are exposed to. The sound of a single shot piercing through your ear can cause permanent hearing disability and are sometimes accompanied by tinnitus (ringing, hissing or humming in the ears). ​What are the important aspects of the Howard Leight R-01523 Leightning L0F Ultra Lightweight NRR 23 Compact Folding Earmuff? ​What other things should you know about the Howard Leight R-01523 Leightning L0F Ultra Lightweight NRR 23 Compact Folding Earmuff? Having hearing protection when going shooting or hunting is very important; just because you have shot before and nothing major happened to your ears doesn’t mean you can do it over and over again. In the long run, the effect would still be the same – hearing loss. Care for your hearing when doing these loud activities by equipping something like the Howard Leight R-01523 Leightning L0F Ultra Lightweight NRR 23 Compact Folding Earmuff. The protection it can give at this price is very worth it. This is best used when you are concentrating on your shooting because it effectively shuts out all sound that it mutes out everything else. If you need something that will enable you to hear sound lower than what is considered harmful, get an electronic earmuff. This will allow you to hear conversations, movements, and all other sound. To make it easier for the user, this earmuff comes with a telescopic adjustment height that stays fixed during use. You don’t have to worry about it getting lengthened or shortened while at work because the headbands have a way of ensuring that your preferred length stays fixed. An added advantage is the fold-up capability of this muff so you can fit it in small locations such as the pocket of your coat or your small bag, allowing you to take it practically anywhere. The Howard Leight R-01523 has a Noise Reduction Rating of 23 that is fairly ideal for shooters and hunters who are frequently exposed to gunfire noises. This rating is not that good if you intend to stay for prolonged periods in the shooting range, especially if there are other shooters in there who are trigger-happy. This protection may note be enough because most firearm shots have a decibel of 160 and above, while the acceptable decibel our ears can take is below 80. Therefore, this muffs is only capable of lessening 23 decibels from the 160 decibels above noise. It is recommended to wear additional protection such as earplugs. This earmuff is designed with sleek ultra slim ear cups for easy movements made from lightweight material that only weights about 40 ounces. The padded headband is made of steel wire construction that provides high performance and robust durability. The steel headbands are resilient and can easily withstand tough environments and lots of usage. However, metal types can become stretched over time, which results to a decreased level of protection compared to plastic headbands that hold their shape better. For less than 20 bucks, you’ll get earmuffs that are durable and will last you years of use with proper care. You can use it not only for the purpose of shooting and hunting but also for your daily life outside the range such as mowing lawn, cutting grass, operating machineries, and many more. It’s also very comfortable to use that you’ll forget you’re wearing it even after three hours or more. These muffs are also pretty slim that they won’t interfere with the stock of some guns and they’re effective at reducing noise to a tolerable level, although this level might not be in the threshold considered as safe. Only con that some owners complained about is that it runs too small. Even with the headband that can be extended, some say that this has a tight fit that’s not for everyone. It is important that you test a product before buying it to ensure its comfort and right fit. 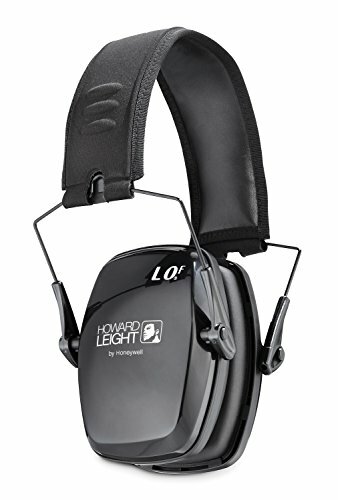 Built with a steel wire around, the Howard Leight R-01523 earmuffs provide a high level of durability while maintaining comfort for many hours. 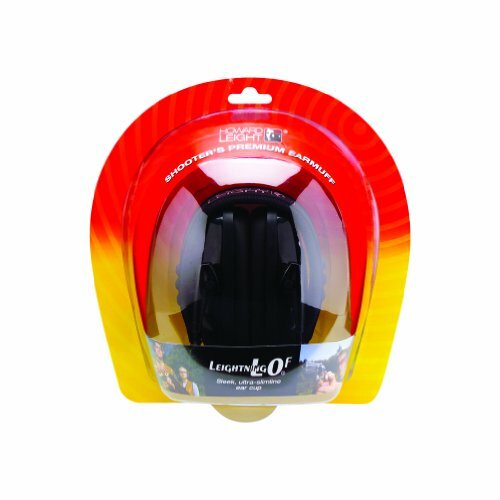 It’s very affordable compared to other brands of earmuffs but it is very effective at providing protection for your ears. Take it anywhere with you because it is lightweight and foldable for use when needed. As mentioned before, it works well as protection in shooting ranges and hunting but its purpose isn’t limited to that as you can easily use it in other tasks involving noise. Don’t take your hearing for granted; invest in adequate protection especially if you are always exposed to noise. A protection for less than twenty bucks is incomparable to all the apparatus and hearing aid you’ll have to purchase in the event that you experience hearing loss. You would want to read more ​​shooting ear protection reviews with our article, "​​What are the best Shooting Ear Protections? ".